This year we have a “Baker’s Dozen” of women who not only work hard in their respective fields, they add also to the fabric of our community. From event planning to home décor, law to real estate, these women have taken their passions and presented them to us on a silver platter. Let’s support them as they support us! When Oscar De Las Salas and Gary Jackson held their wedding at Centennial Park last August, the ceremony was marred by gay slurs shouted from a nearby condominium. The story made national news, which was seen on Facebook by Coronado resident Alisa Kerr. “The treatment they received is not an accurate reflection of the community of Coronado,” said Kerr. “So I wanted to fix it.” Kerr sent an email to the grooms inviting them back for a “do-over I-do” and when they gratefully accepted the invitation, Kerr recruited her friends Rita Alipour, Kate Blumenthal and Cerissa McPartlin Kieffer, who were immediately on board to host the grooms for what the ladies envisioned to be a small, casual renewal ceremony on the beach. Coincidentally, just two weeks earlier the four friends had decided to form a club focused on celebrating and preserving the character of Coronado, and named themselves the Islanders Ladies Club. Kerr emailed her friend George Allen at Loews Coronado Bay Resort and asked him to comp the grooms a room for their do-over wedding night. Allen not only agreed to provide the room, he also offered to host the entire event for 300 guests at the resort. And immediately the wedding took on a whole new life. Alipour set up a “Coronado Loves Oscar and Gary” Facebook page where Coronado residents immediately began offering all manner of wedding services from music and photography to flowers and cakes. With the generosity of Coronado residents and businesses and countless hours of planning, the ladies pulled off a beautiful wedding for Oscar and Gary. So who are the Islander Ladies? Kerr is an attorney whose Coronado firm, Kerr Law, specializes in estate planning and business law. Alipour, the mother of four, is a graduate of USD law school with plans to take the bar exam in February to join Kerr’s firm. Kieffer’s involvement in the wedding has revived her interest in her Coronado event-planning business, Pomegranate Events, while she raises two young children. Blumenthal is a stay-at-home mom with two small children. All the ladies have been involved in community organizations and take a lot of pride in Coronado. While they never expected this story to receive so much interest, the Islander Ladies Club is pleased that the event turned a negative story about Coronado into an international love story. Whoever came up with the line, “If you want something done, give it to a busy person” must have had Cathy Brown in mind. Catharine Ann Brown is Operations Manager of the Investment Development Division of SoCal Premier Properties, a Coronado-based company that buys and sells real estate for investment throughout Southern California. She has been directly involved in more than 450 transactions over the course of three years totaling more than $150 million. Cathy serves on the board of the Coronado Real Estate Association (CREA) and this year was elected to the California Association of Realtors board of directors. She holds a BA in public administration and economics from Fordham University in New York City and an MBA in marketing from University of California, Riverside. Back in her homeland of Cape Cod, Cathy was co-host of ‘The Cathy and Don Show” a drive-time talk show airing over WXTK, a 50,000-watt radio station on the edge of Boston. In her hometown of Dennis, Massachusetts, she served as a “Select Man,” equivalent to a city council position in Coronado. “Dennis, like Coronado, had a population of around 20,000 and, like Coronado, its population surges during the summer,” she said. Speaking of Coronado summers, Cathy may be best known as President of the Coronado Promenade Con–certs, where each week this past summer she has introduced all the crowd-pleasing bands. Moreover, she and her board raised the money necessary to pay those bands, and to upgrade the infrastructure including a new sound system for the popular concert series. Cathy may never have settled in Coronado if not for Family Feud. She and her two sisters, mother and a cousin were the big winners on the TV show, and Cathy used her share of the $10,000 prize money to treat herself to a fitness weekend in Santa Barbara. That’s where she met Coronado resident Nancy Lenhart, owner of New Directions & Lifestyles, a health and fitness company. In short order, Cathy moved west to become the company’s national marketing director. Now Cathy is gearing up for her next big promotional event. She has been the moving force behind the Coronado Turkey Trot, the first fundraiser for Rady Children’s Hospital Auxiliary — Coronado. The 5K race takes off at 8 a.m. on Thanksgiving Day and Cathy will be at the start line, wearing her turkey hat. Kate Chan has worn many hats in Coronado, San Diego and around the world. She is a serial entrepreneur with diverse interests and successes in real estate, finance, technology start-ups, and most recently, fashion and beauty. Kate believes that there is really never an end to anything, instead, “there is flow, continuity, harmony.” On a trip to Asia and the Philippines (her homeland) in 2010 she had an epiphany when she discovered native artisan pieces unlike anything she had seen in her global travels. She knew that these unique and exquisite pieces would draw international acclaim. Kate immediately wrote a business plan and assembled teams of artisans in the Philippines and Eastern Asia to bring her design visions to life. Sustainable and inspired fashion, eco-consciousness, environmental and social awareness are all woven into the KATE CHAN brand of affordable luxury jewelry and accessories. Through the brand, she is able to create and collaborate with her team of talented artisans in marginalized communities. Livelihoods are uplifted, traditions are preserved and communities are sustained. Her accessories elevate one’s fashion style from the heart. Launched just last year, KATE CHAN is marketed globally from her Coronado headquarters (and boutique) that functions as a showroom for local and international buyers. The KATE CHAN brand is already featured in hotels in Hawaii, including the prestigious Halekulani on Oahu, the Bernardus Lodge in Carmel and, of course, at Hotel del Coronado. This year she opened the Kate Chan Salon, featuring the island’s most seasoned and established hairstylists, aesthetician and nail technicians. Kate has served in sales management roles in Real Estate Finance for 26 years. She and husband Benny Chan continue to develop Real Estate: their latest project, Glorietta Bay Point luxury condominium residences overlooking Glorietta Bay has just come on the market. “I feel very blessed to have had many passions and opportunities in life,” says Kate. “I always want to serve others and create value. I work hard and it’s all driven by my vision, purpose and dedication. It was just a year ago that Linda Cunningham welcomed her daughter Amber into the folds of Coronado Floor & Window Interiors, as Office Manager, where she is responsible for financial activities, management and operations. The dynamics have been fabulous, says Linda, who credits Amber, who studied business at Hope International University in Fullerton, for her keen eye for creative design in advertising and marketing. “She’s been handling all of our social media, website development and advertising,” says Linda, who concentrates on providing her clients with expert design guidance for their floor and window coverings and much more. Likewise, Amber is learning the design business by watching her mother, who brings 20 years of expertise in the field, in action. The Cunninghams moved to Coronado in 2004 from Portland, Oregon where Linda and her husband Don owned a custom homebuilding firm. Linda studied interior design at Mesa College and the Art Institute of San Diego, while working for Coronado Floor & Window, the company she purchased in 2012 and expanded into a full service design studio. 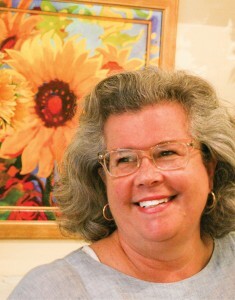 Concurrently, she operated her own design company, Designs by Linda Cunningham, with services ranging from home staging to complete home renovations. 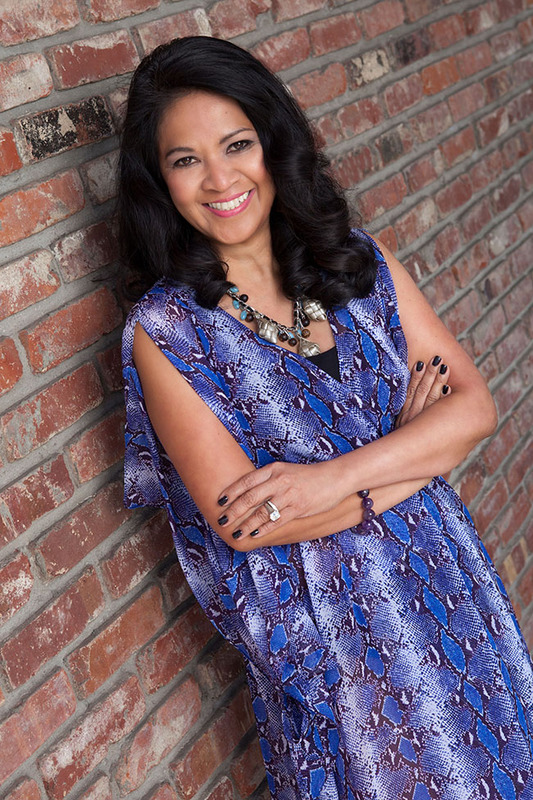 Graduating with a degree in Interior Design, Linda is an Allied Member of ASID, and a professional qualified member of National Association of Pro-fessional Women. She is recognized as an expert in solving design dilemmas, and has authored design columns and articles in local newspapers and magazines. In addition to several lines of hardwoods, and renewables such as bamboo and cork, the Cunninghams’ shop features a vast array of carpeting samples (“including some fabulous wool lines that will last and last,” Linda notes) and laminates. Linda and Amber are excited to announce that the shop will soon feature a kitchen design boutique, with vignettes of kitchens, showing cabinetry, countertops and flooring. 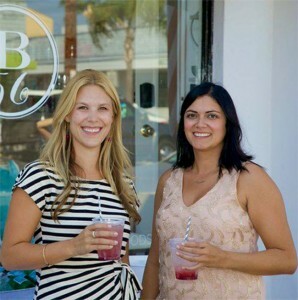 Linda and Amber reside in Coronado. They are active with their church, The Rock, in Point Loma, and look forward to a full day of “work” in early December at their church-sponsored “Toys for Joy” program for underprivileged kids and their families. “We kind of take over all of Lincoln High School for the day,” says Linda. “We give out toys for the kids, clothing and items for the parents, plus groceries, haircuts, even dog food for pets. Christine Gordon-Dill is one of those rare breeds — a Coronado native, born in the small annex hospital that used to be at North Island Naval Air Station. She’s also rare in another context — she’s an artist who has experimented and excelled in different mediums throughout her life — pastels, oils, art-to-wear and photography among her visual mediums, but also poetry, performance art and dance. 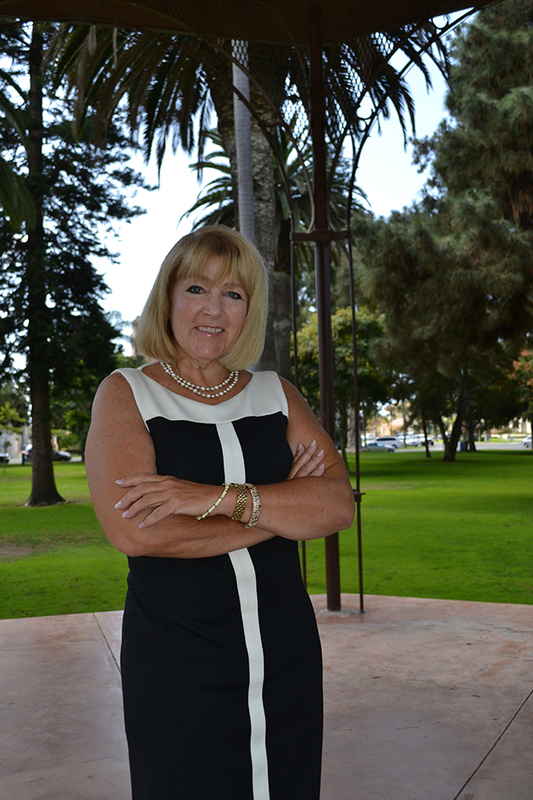 Although Christine grew up in Bonita, it wasn’t long before she found her way back to Coronado. At age 18, while attending college by day, she worked as a switchboard operator at Coronado Hospital on the 3-11 p.m. shift during the 1970s. Over the next few years, Christine and Dr. Donald Dill struck up a friendship and it grew into love. This year, the Dills celebrated their 35th wedding anniversary. 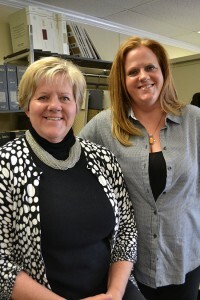 The couple works together at Dr. Dill’s Health & Wellness Center, where Christine is Assistant Office Manager. 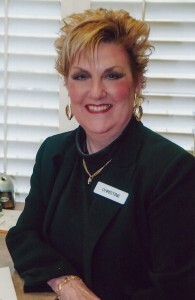 Christine graduated from UCSD with a degree in Visual Arts with Honors in 1981. She also holds a degree in Visual Arts from Southwestern College, where she returned in later years to study dance; today, she continues ballet with weekly lessons at her home studio. In 1998, she and Dr. Dill renovated the Health & Wellness Center, and Christine supervised the project, adding environmental spaces to her artistic repertoire. The center additionally serves as a gallery for Christine’s art; she currently has 78 pieces mounted throughout the space, plus her greeting card line, which incorporates photographs of flowers and nature with individual handwritten affirmations. Pat Marshall is, in a word, fearless. She opened Côtier in 2009, at the height of the economic recession. But for Pat, all things were coming together and she was thrilled to be able to harness her years of experience in all levels of merchandising and decorating to create the store of her dreams. Today, Pat’s shop is not only a retail store, but it also provides a window to a world of distinctive furnishings and home décor services offered by Pat and her staff. The daughter of a Navy fighter pilot, Pat first visited Coronado at age 9 when her father was assigned to a carrier. “Coronado was always a place I loved,” said Pat, which led her to purchase a second home here in 2002. But for much of her life, Pat lived in the Washington D.C. area. When she was in third grade, her father was assigned to the Pentagon and the family settled in McLean, Virginia. Pat earned a bachelors degree in business from Marymount University where she also studied design. She worked in retail management for Hecht’s, followed by 10 years with a luxury goods company in Boston where she developed an expertise in fine jewelry and finally was Executive Vice President of Merchandising for Retail Ventures, Inc., with a large presence in the Midwest and East Coast. She may have been retired from corporate life, but now Pat wanted to strike out on her own. “It seemed terrible that an iconic beach town did not have its own signature furnishings store,” said Pat, who found the perfect setting for Côtier on B Avenue, the site of the former Seaside Home store, which had been vacant for six months but retained great architectural elements. 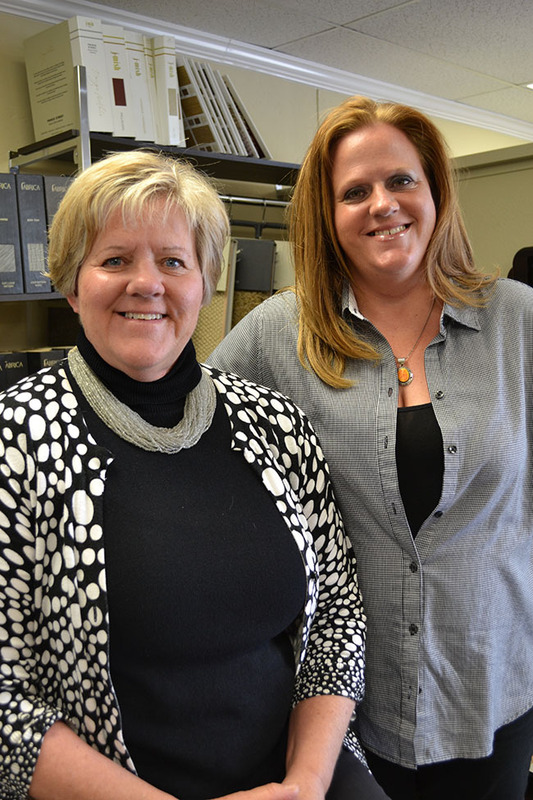 Karyn Frazier and Jessica Nicolls are happy as clams these days. They’ve realized their dream of opening a boutique that not only showcases their interior design services but also offers fun accessories and gift ideas. 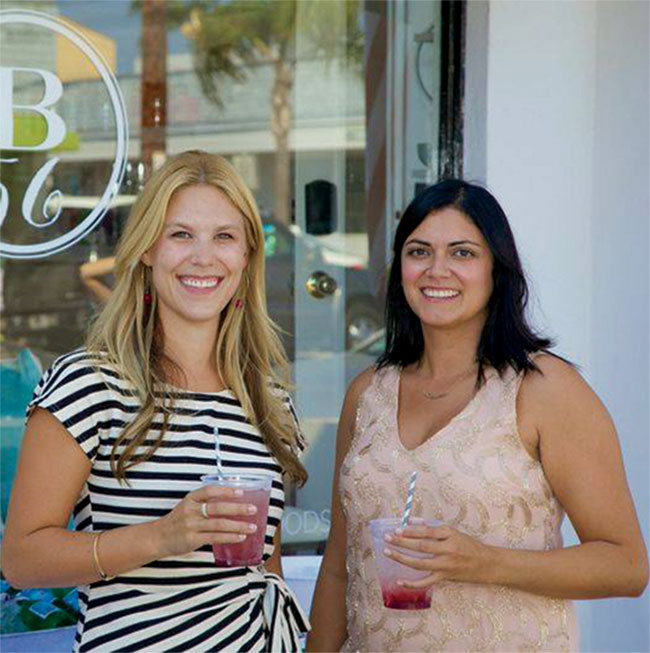 At Bungalow 56, Karyn and Jessica help their clients celebrate life … by making everyday surroundings and milestone events — weddings, birthdays, baby showers — magical. The women have been collaborating on all things creative since they met in 1996, where they worked together at a fashion boutique in Truckee, Calif. They are known for a design style that features super clean lines and neutral colors. “Then we layer on textures and pops of colors and accessories, which our clients can switch out so the design is timeless and versatile,” Karyn explains. They’ll frequently use reclaimed items and “repurpose” them. “Karyn will recover ‘grandma’s’ old chairs and paint them so they will work with our designs,” says Jessica. Karyn took Jessica up on the idea and, surprisingly, the women have found that there’s much in common between the two small towns, one tucked high in the mountains, the other at sea level. “And supports each other,” adds Jessica. The women are members of the Coronado Junior Woman’s Club and Bungalow 56 was one of the stops on the club’s Taste of Coronado event in October. They’re also members of the Coronado Chamber of Commerce and “We donate to a number of charities in town,” Karyn says. 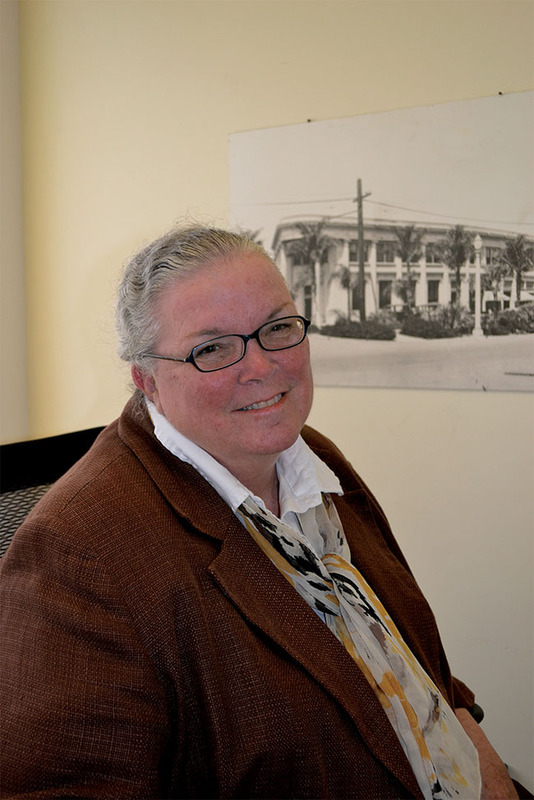 Executive Director, Coronado MainStreet, Ltd.
Sixteen years ago Rita Sarich joined the Coronado MainStreet organization and was able “to come home” to work in the community she loves. She had previously spent 20 years as an administrator with a San Diego healthcare organization and was thrilled to say goodbye to high stress corporate life and commuting. Under the tutelage of former MainStreet Executive Director Toni Gaylord, Rita learned the ins and outs of grass roots diplomacy and advocacy to create and preserve a vibrant downtown core. Organized under the umbrella of the National Trust for Historic Preservation, more than 2000 cities across the nation are part of the Main Street program. In the year 2000, Coronado won the Great American Main Street Award that annually recognizes exceptional Main Street communities. district revitalization. Rita and her 11-member board also oversee the design and maintenance of 16 Orange Avenue median gardens, roof-top lights, the MotorCars on MainStreet car show each spring and the Downtown Goes Ghostly trick-or-treating event each Halloween. Rita has served on the board of the California MainStreet Alliance for the past five years and is currently treasurer. She is also a member of Rotary Club of Coronado. She and her husband Darrell married in Coronado in 1975 and raised their family here. “There is no better public school district anywhere,” Rita attests. She lauds Coronado as being a perfect example of what a small, committed community can achieve with the right amount of passion, communication and caring.